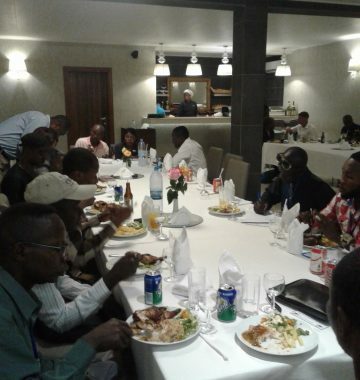 In an exciting new development, LifeLine Nehemiah Projects (LNP) hosted a Dinner and Round Table Talk for Employers in Sierra Leone on the 18th February 2017. A total of 28 employers from different regions came together at the Hub Hotel to talk about the training that LNP offers through its Betteh Tumara Technical and Vocational Institute, explaining how and why they partner with employers and seeking feedback and suggestions from all those involved. Led by a team from LNP, including PJ Cole (Executive Director) and Jabba Pessima (Head of Tec/Voc training at the Betteh Tumara Institute), they facilitated an open forum for discussion and comment. All of the employers gave very positive responses to their involvement with the Betteh Tumara Institute. Many commented on how impressed they were with the training offered by LNP, one employer confessing that he had not realised that students are offered this training without charge. All are open to receiving trainees; some (such as Kamaz Construction and Engineering Ltd and Sierra Construction System) have taken as many as 13 at a time! One employer – Home Leone, a construction company who build low-cost homes for people living in the slum area of Freetown – expressed their appreciation of the training model used by LNP by stating that they would like to replicate this in their own organisation. Other organisations taking part included representatives from Sensi Tech Innovation Hub, Afromeric Institute of Cosmetology, Defence for Children International, Wonder Beauty Salon and Electricity, Distribution and Supply Services, Kenema. Suggestions for the future included further training on data collection and management skills, and the need to visit the placement before commencing the internship so that students were better prepared to undertake the work expected of them. Some employers have suggested that they might award their own certificates for participating in the internship. Everyone who attended felt that this had been a valuable event in promoting effective working relationships between staff, students and employers. Our thanks to David Bathalomew, Project Manager for the Betteh Tumara Technical and Vocational Institute, for sending us this report.